Carbon from relatively new sources of organic material on the surface, or young carbon, can stimulate microbial communities deep in aquifers, leading to the release of arsenic into water, according to a recent field study by Columbia University Superfund Research Program (SRP) Center researchers. The researchers found that near-surface sources of organic carbon are central in microbial metabolism, even in aquifers that are far below and separated from the land where carbon is derived. Arsenic contamination affects the drinking water of millions of people around the world. In Bangladesh alone, 50 million people are exposed to arsenic via drinking water contamination. In the majority of these environments, arsenic is released into water through biological respiration of arsenic bound to iron oxide in sediment. This respiration requires organic carbon, but the sources of that carbon driving the microbial-mediated release of arsenic to shallow groundwater remain poorly understood. This study sheds light on this question using a novel method of characterizing the radiocarbon age of phospholipid fatty acids (PLFAs). PLFAs are molecules that are part of the cellular membranes of all living organisms and are often used to assess microbial abundance. This method to determine the age of organisms established that the microbial respiration in aquifers containing arsenic uses carbon that is much younger than the carbon in the sediments. 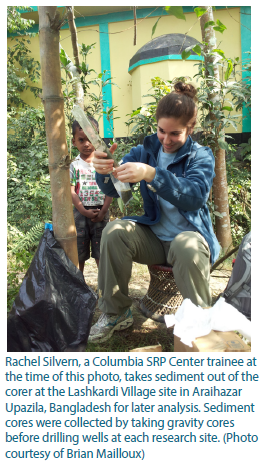 In the field study performed in Araihazar Upazila, Bangladesh and surrounding areas, researchers characterized the radiocarbon age of PLFAs, which provided information on which carbon substrates were being used. They measured the relative abundance of specific PLFAs to identify the microbial community present. The research team has also performed radiocarbon analysis of DNA from microorganisms in the groundwater. Their analysis showed that the microbial communities preferred to use dissolved organic carbon that came from younger sources of sediment found near the surface. 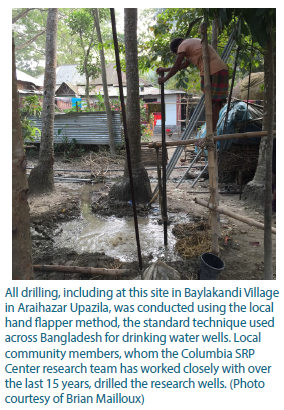 Because the microbial communities drive the release of arsenic from sediment, this suggests that young dissolved organic carbon is very important to the mobilization of sediment arsenic in Bangladesh. By measuring sediment samples as part of this study and large volumes of groundwater as part of a previous study, they determined that the radiocarbon ages of PLFAs from a small volume of sediment was equivalent to the ages of DNA sampled by pumping as much as 20,000 liters of groundwater. By doing this, they were able to show that both methods provide consistent results. When samples are available, the sediment sampling method provides a simple way to measure PLFAs and therefore has implications for further research to describe microbial metabolism and arsenic contamination. In the United States, half of all Superfund sites are contaminated with arsenic. At these sites, similar changes in groundwater hydrology and the input of other organic wastes or organic chemicals have the potential to adversely affect groundwater arsenic levels and overall water quality. These radiocarbon methods can be applied to other areas to understand the origin of arsenic contamination and how to target and optimize remediation efforts at these contaminated sites. Researchers found that near-surface sources of organic carbon are central in microbial metabolism, even in aquifers that are spatially separated from the land surface. They also found that dissolved organic carbon was efficiently and rapidly transported into aquifers. Since this dissolved organic carbon is transported in water, the researchers concluded that there was a hydrological connection for efficient transport of water between shallow sources and the aquifer. Given that one of the sites examined was covered by a thick clay and that groundwater could circumvent this barrier, the researchers concluded that these barriers may not be as protective of water quality as previously believed. In many areas, groundwater pumping is increasing to provide water for domestic and agricultural uses. This increase in pumping has drastically affected how fast water is drawn into aquifers. According to the authors, the corresponding increase in the rate of groundwater flow from the surface into aquifers could cause more reactive dissolved organic carbon to enter aquifers from surficial sources. This increase in reactive carbon could stimulate additional microbiological respiration and lead to additional groundwater contamination, which may impact water quality in low-arsenic Pleistocene aquifers currently used as high quality drinking water sources. To receive monthly mailings of the Research Briefs, send your email address to srpinfo@niehs.nih.gov.